I don't disagree at all: an Independent should get its geographic share. The only relevance of per capita is for historical analysis as part of the Union. Notwithstanding, as the analysis show historically (at least on the data I've seen so far) Scotland has effectively received its geographic share back in higher public spending. That looks fair enough to me; what am I missing? I arrived at your blog as a result of an extremely patronising tweet ("Try thinking, it's liberating") but I'm glad to see your blog is more thoughtful. I could comment on just about every part of this post, but life's too short, so I'll keep it brief. I don't take much issue with much of what you say about the past: as a part of the UK, the oil wealth goes into the central pot rather than benefiting only one part of the country. Fair enough. But the argument isn't about the past (except for illustrating "here's what you could have won"). It's about the future, about what Scotland could be like in the future. And we can only do that by dissecting the actual figures from the recent past. You appear to be bamboozled by the 9.9% of taxes / 9.3% of spending thing, in the sense that you don't see the relevance of the figures. Well, consider the other side of that relationship: the rest of the UK contributes 91.1% of taxes but gets 91.7% of spending. So if your analysis is that Scotland benefits from such a position, then presumably your further analysis is that rUK also benefits, but much more so. But there's more. The figures for Scottish spending include items we wouldn't be paying for if we were independent. The figures include £3.5bn p.a. (£700 per head) for defence, of which only £1.5bn is spent in Scotland (and that includes all shipbuilding). If we were independent, we could easily save a billion of that, and still manage to spend more of it within Scotland - AND provide armed forces that actually gave Scotland what it needed, e.g. surface ships based here, not 500 miles away; rather less spending on foreign wars; troops based within Scotland, benefiting local economies. We would no longer need to contribute £50m towards the running of the houses of Commons and Lords. We wouldn't have to contribute to projects ostensibly for the benefit of the whole of the UK (so with no Barnett consequentials) such as London Crossrail and London sewer renewal, if we're looking at the past, and HS2 and Trident replacement, if we're considering the future. We would also save on our share of government bureaucracy. At the moment, Scotland outsources a huge amount of work to rUK, and primarily to London - one of the most expensive places in the world for staff and office costs. The same bureaucracy in Scotland would be cheaper for three reasons. 1. Lower staff and office costs 2. tax and NI contributions from those jobs would come straight back to the Scottish treasury 3. the net income would benefit the wider Scottish economy by being spent largely within Scotland. Finally, in your reply to a previous commenter, you say "Scotland has effectively received its geographic share [of oil revenues] back in higher public spending". Except it hasn't, because you haven't taken account of the accumulated debt that the Westminster government have kindly borrowed on our behalf. The analysis by noted unionist Prof Brian Ashcroft showed that, if Scotland had been independent since 1982, and it had had the same spending patterns as it did as part of the UK over the same period, it would have an accumulated surplus of £68bn, not a share of a £1.3tn debt. 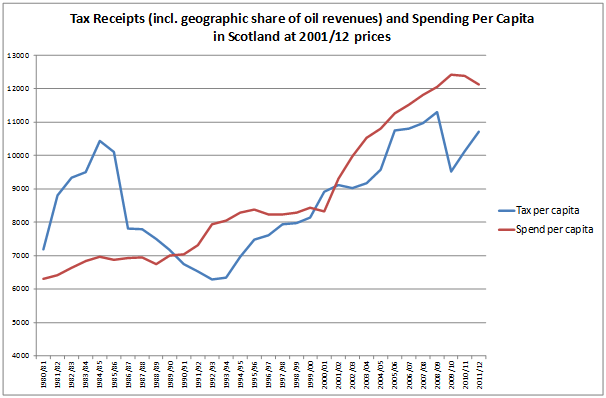 See http://www.scottisheconomywatch.com/brian-ashcrofts-scottish/2013/07/has-scotland-already-spent-its-oil-fund.html. Actually, he concludes that "Scotland did all right from the Union over a period of 30 years", which is a bizarre conclusion when you've just shown a surplus of £68bn was turned into a debt of £80bn or so. He seems to think it was worth it. I disagree. I mean 90.1% of taxes / 90.7% of spending for rUK. Duh. Ewan: thank you for taking time to read and respond so thoroughly; it's exactly the sort of reasoned argument that I have been frustrated simply can't take place with the 140 Char limitations of Twitter. I also apologise if those frustrations led me to be be a bit patronising on a Tweet -- I did check and it wasn't to you and was in response to some provocation but, nonetheless, I regret coming across like that. "bamboozled"? If I was inclined I could suggest that is a partonising statement ;). 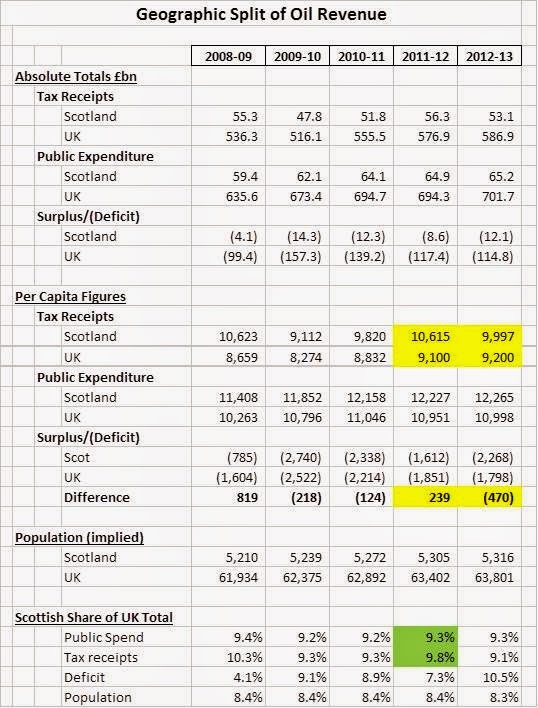 I've re-run the numbers with actual GERS totals (I'd crudely grossed up via population #s before) and realised in the process there was actually a spreadsheet error (nobody would have noticed but I feel its only fair I hold my hands up on that). The overall story is unchanged and I really don't think I'm bamboozled by the numbers -- I have gone to source, recreated all the figures quoted and shared my interpretation. What you are doing is taking 1 year and drawing a conclusion (exaggerated by the use of misleading %age figures instead of absolute per capita ones) .. I show the longer trend and look at the more representative figures and leave it to the reader to judge who's conclusion is right. 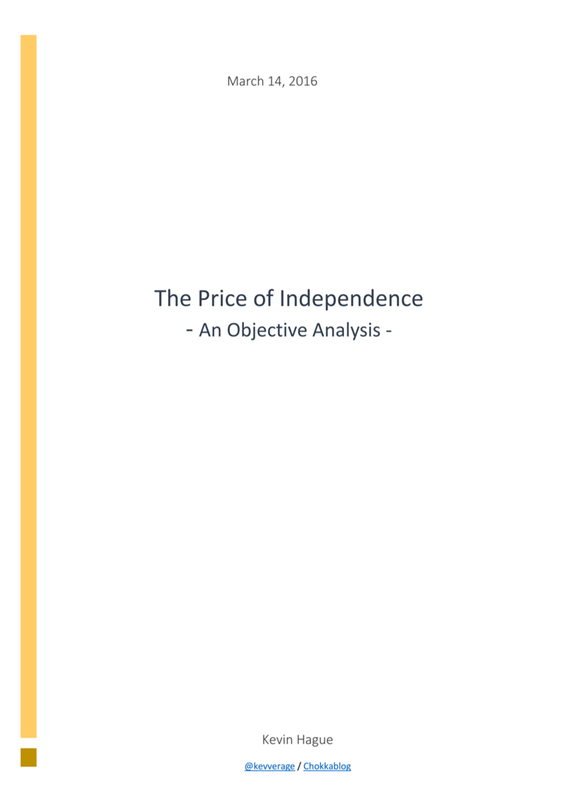 I could comment on each of the "we wouldn't need to spend as much" examples you give (I disagree with your conclusion in every case) but that is for a separate post -- the main point I would make is that *nowhere* have the pro-indy campaigners shown even an estimmate of the full financial costs of separation (partly because there are massive costs simply not estimated at all) and no attempt has been made to actually add up the sums. If I've missed that analysis please point me towards it. Without that analysis cherry-picking examples that you think are net cost savings is a meaningless exercise. As for the Brian Ashcroft reference ... well I'd read that article and now I've read it again. He explains very clearly why he draws the conclusion he does so I won't repeat it here. I suggest you re-read and reconsider if the conclusion is really so "bizarre"
Thanks for your reply. You're right, this is much better than Twitter. I wasn't suggesting you were bamboozled by the figures (you're clearly not), but by the notion that comparing % of tax and % of spending is a valid way to present figures. It is. In this example, all four regions receive the same amount of spending (in cash terms, not necessarily per head), but it's quite clear that Oz is paying slightly more in than it's getting back, and the other three regions are paying in slightly less. The table above illustrates very clearly, for each region, what its relative contribution to the national accounts is. If it happens that Oz has only half the population of the other regions, then clearly spending per head must be double that of the other regions, but that doesn't alter the conclusion that Oz is a net contributor and the others are not, and it doesn't alter the usefulness of the table's figures. Now suppose that the government is allowed to borrow, and as a result all regions increase their spending by 1%. So the amount of borrowing required by the government is 1% of spending, but in cash terms Oz is still paying in more than it takes out, and the table continues to illustrate the relative contribution of the regions. This remains true whether Oz has a higher or lower population than the other regions. What if all regions increase their spending by 10%? Now Oz is also spending more than the tax it's contributing, but to a lesser extent than the other regions. And the table still illustrates the relative contribution of the regions to the central accounts. "To put this another way Scotland had returned to it in spending for the Scottish people 95% of the tax revenues it generated". That is, on average, 95% of our taxes were either returned to us in the form of government spending here, or were spent elsewhere but (supposedly at least) for our benefit; while the remaining 5% of Scotland's taxes were retained by Westminster and used for things that didn't benefit Scotland in any way whatsoever. That's 5% every year, totalling £68bn over the period. That's £68bn which, if we'd been independent, we could have spent or saved (or benefited from in the form of lower taxes). 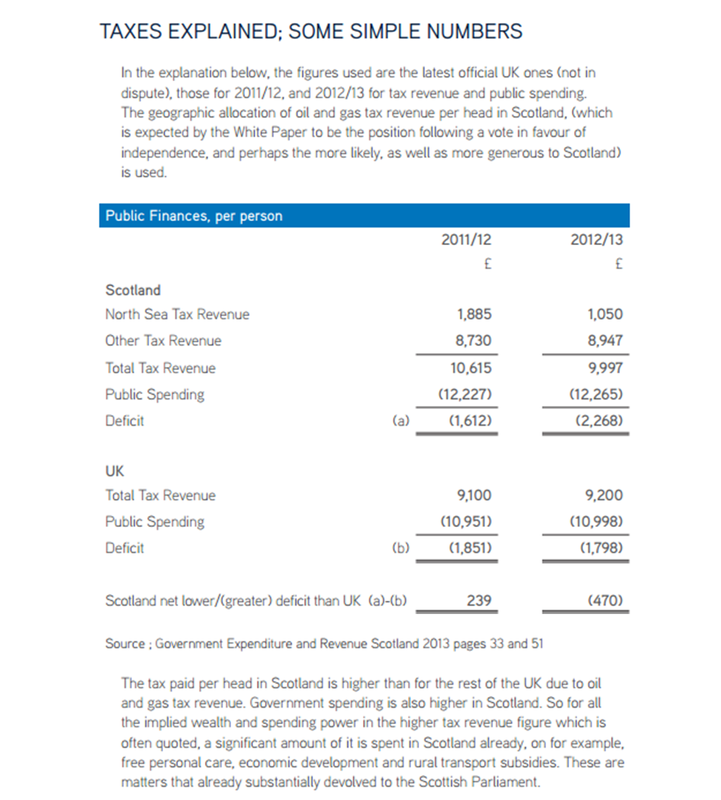 What we actually got was a share of the UK's deficit, which is so big that taking account of the interest payments turns Scotland's otherwise balanced public finances into a substantial deficit. And he describes this as doing "all right from the Union over a period of 30 years"? Bizarre. This is now too long for a single post, so I'll split it here. Costs of setting up required bureaucracy: I don't pretend any special knowledge of this, but there's been a lot about it in the news over the last few days. The following figures are from memory but I don't think they're far wrong. The Treasury's published figure was around £2.7bn. Prof. Dunleavy said that was a 12x over-estimate. Later he estimated £150m - £200m, which is in the same ballpark as Alex Salmond's estimate of £250m. I also heard Danny Alexander claim that Canadian research had estimated costs at 1% of GDP. That's a one-off cost. Compare that to the 5% of taxes (so ~2.5% of GDP) every year for 30 years that Brian Ashcroft thinks is an acceptable price to be in the union. Finally, I'm surprised that you disagree with my examples of savings that could follow independence, as I thought they were pretty uncontroversial. You don't say exactly what you disagree with, but let me expand upon my comments and then perhaps you could expand upon yours. Crossrail/Sewers/HS2/Trident replacement/Commons/Lords: I've nothing to add, but I'm interested to know under what circumstances an independent Scotland would continue to contribute to the costs of these. Benefits of not outsourcing bureaucracy: I've nothing to add, but again I'm interested in your analysis of why this is wrong. This has become rather long, but I do hope you will be able to reply in detail to it, preferably point by point. I genuinely want to understand exactly why you see things differently from me. Ewan: To your first post of two posts above. What you say is true "if tax=spending" .. if it doesn't, (and it doesn't) then %age comaprisons are misleading its as simple as that. The numbers are there in black and white so we don't really need to debate that point further. Ewan: on your second comment. The first paragraph is already covered but let me restate it. We were in a Union where we expect (both ways) to share assets and risks, to pool our resources, "to be in it together" ... that we effectively "shared" our oil revenue "95 to me, 5 to you" is, um, not too bad. Defence spending I haven't yet covered in my research so I simply don't know enough about the details and trade-offs to comment. You might well be right. I have followed my nose in the debates and defence spend has not (yet at least) been given much airtime. On the other costs I am working up a full analysis as I think part of my problem is I've never seen a reasonably comprehensive and well researched/sourced summary of the numbers involved. Until I've completed that I won't comment further as I like to have done my research fully and understood big picture before arguing specifics. There are certainly plenty of arguments to consider against any mooted cost savings: bureaucracy duplication, other cross-subsidising (energy pricing & flat-rate postage for example), loss of scale benefits, creation of new sources of friction and inefficiency because of need for arm''s length agreements, regulatory bodies etc. So I need to work that out before I can respond meaningfully. Appreciate the thought and time behind your comments. on tax/spending %ages, we are just going to have to disagree. I've given you a step by step analysis, starting with simple figures and becoming more complicated in discrete steps, which is the best way to analyse complex problems because it's easier to spot logical disconnects. I don't know what your background is, but mine is a degree in maths/statistics followed by a decade in the financial industry (and then other stuff). I understand numbers at a deep level, and all my knowledge and experience tells me unequivocally that the tax/spending %age comparison is as valid when there's a deficit, or when there's a surplus, as when there's not. 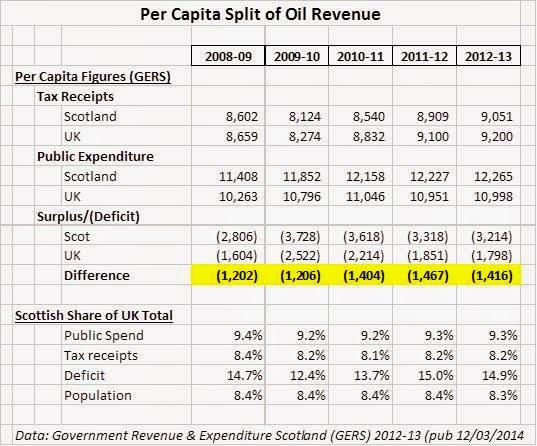 On the oil point, can I just point out that we didn't give away 5% of our oil revenues, we gave away 5% of all our revenues - oil, income tax, VAT, NI conts, corp tax, CGT etc. I've already agreed that as part of a union "pooling and sharing" is what it's all about. I just disagree that "pooling and sharing" has been to our benefit as Better Together claims it has, and I think Brian Ashcroft's analysis that showed a potential £68bn surplus became an actual £80bn debt illustrates that perfectly. And that's taking full account of the "extra" spending through Barnett, and ignoring the sums that an independent Scotland wouldn't have spent on nuclear weapons, foreign wars, London sewers etc. I note you're going to look in more detail at defence spending and other matters. I look forward to reading about it. To change the subject completely, I note from your profile that you're involved with Endura. My Merino Baa Baas are my most favourite bit of kit ever. In fact, they're among my most favourite things ever - they are SO good. But I'm more of a hillwalker than a cyclist, and I would love to be able to go into Tiso's, for example, and buy some gear from a Scottish company. Particularly if it was actually made in Scotland - something I haven't been able to do since North Cape went belly up decades ago (excluding Slioch, which was tiny and out of my price range at the time anyway). Would be nice to be able to learn about a relatively technical economic issue without the random bit of Christian bashing half way through.